I would like to share some information to help you make your own bow. The simplest form is really not difficult to make and you will be surprised that it will work. That is : take a stick, tie some horse hair at both ends and put a little wedge between stick and hair at the frog end, rosin the hair, and you can play. 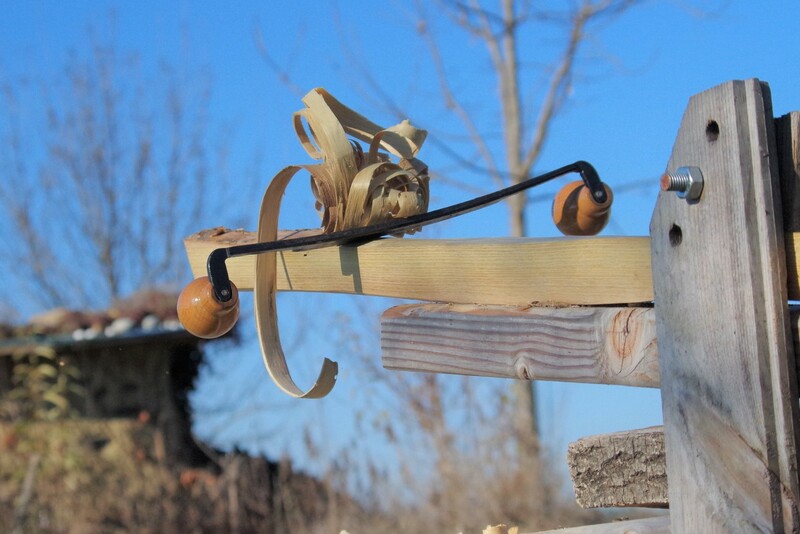 It’s true that making a good bow is an art but everybody who likes to experiment can try to make something. 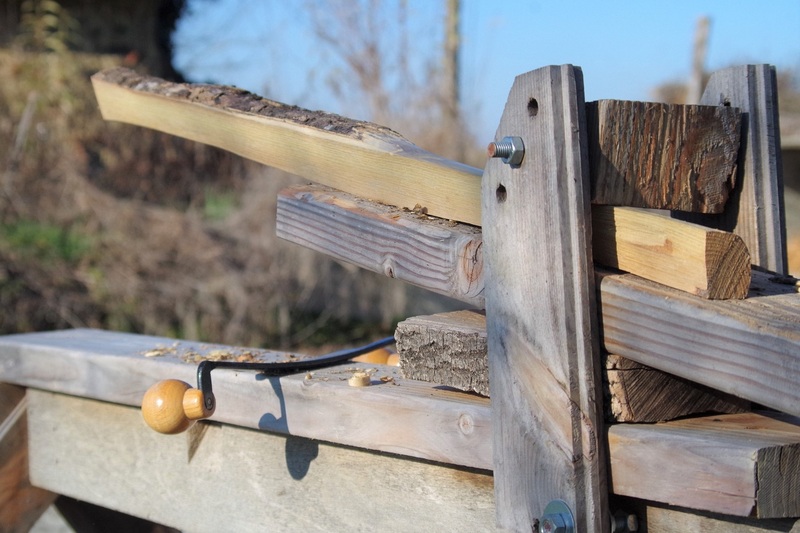 I love to work with a drawknife on the shaving horse and then with the bandsaw. The photos will speak for themselves. Then I go inside at the workbench with knife and planes to do the precise work of shaping the bow. 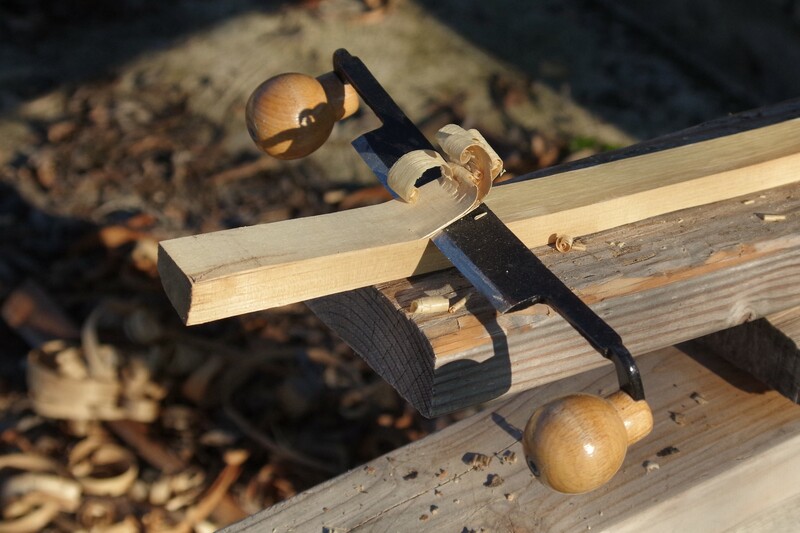 For bow making you want to have the blade at a sharp angle in the planes, like the first of the two details. Make the future bow first square, with 4 sides, then 8 sides with a nice course from thicker at the frog end to finer at the tip. When you go to 16 sides the stick is almost round. 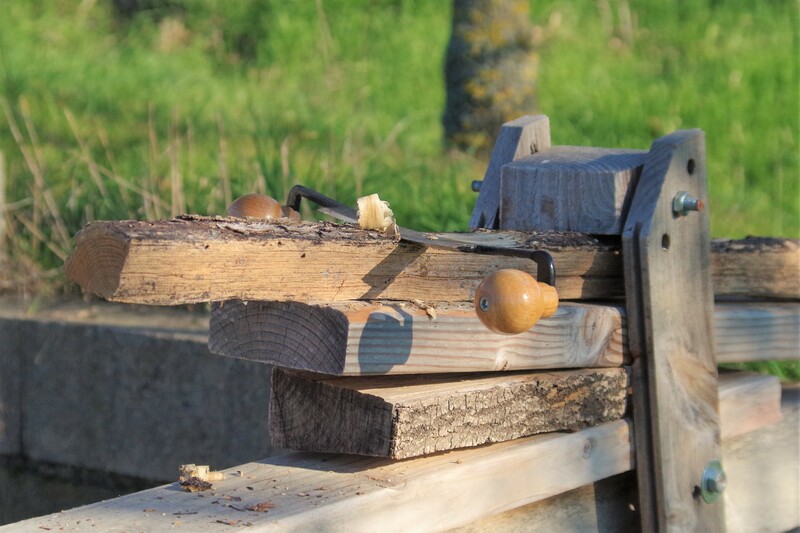 Then mortises and wedges. 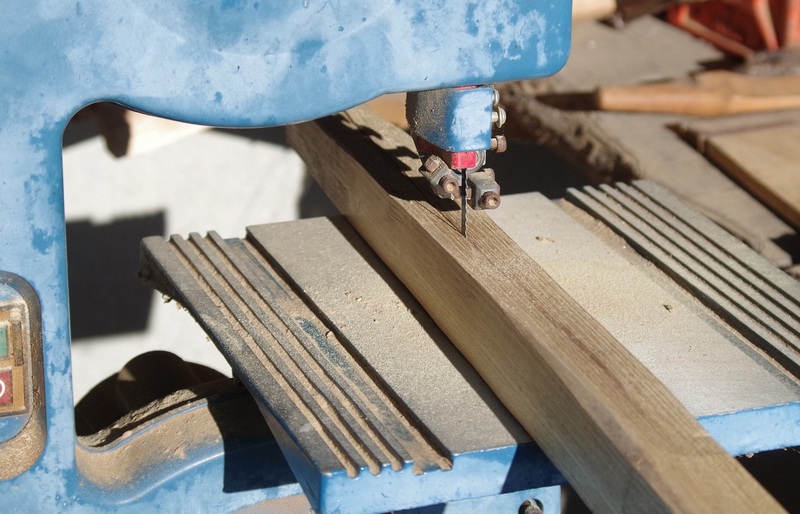 I start making the mortises by making two holes slantwise at the outer end with a 2.5 or 3 mm drill. 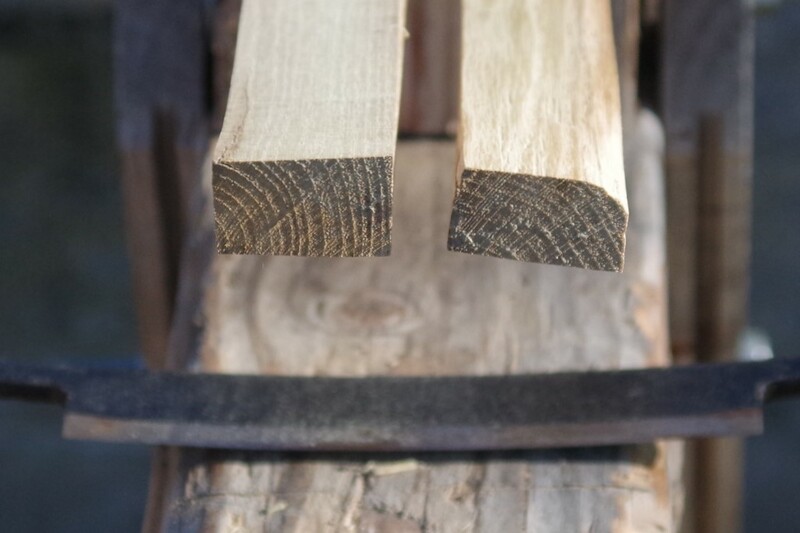 Then some more (2 for the tip and more for the frog end) to make the mortise with the chisel (4 mm) more easily. You can make the wedges from beech, around 3 mm thick. Make them strong enough to put them in and take them out as much as needed in the whole process. Have a look at the video : How to shorten the play length of the hair. Where do you find the horse hair ? The best option for me is to get some hair directly from a horse. If you know a violin maker to ask some hair that is a good option as well. You can buy some for the first bows. If you have a horse or friends with horses, take some of the tail, get the short hair out and tie one end before washing. You can simply wash in warm water with soap, rinse and let it dry. 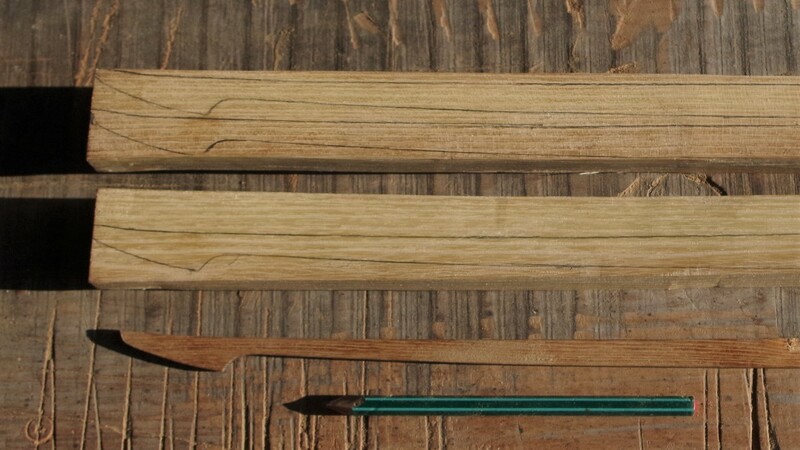 Then you choose the right amount for one bow (between 100 and 150 if you want to count them), choose the right length and make a good tie at the end which goes in the tip, which corresponds to the end of the tail. Cut the end and put a drop of super glue on it . 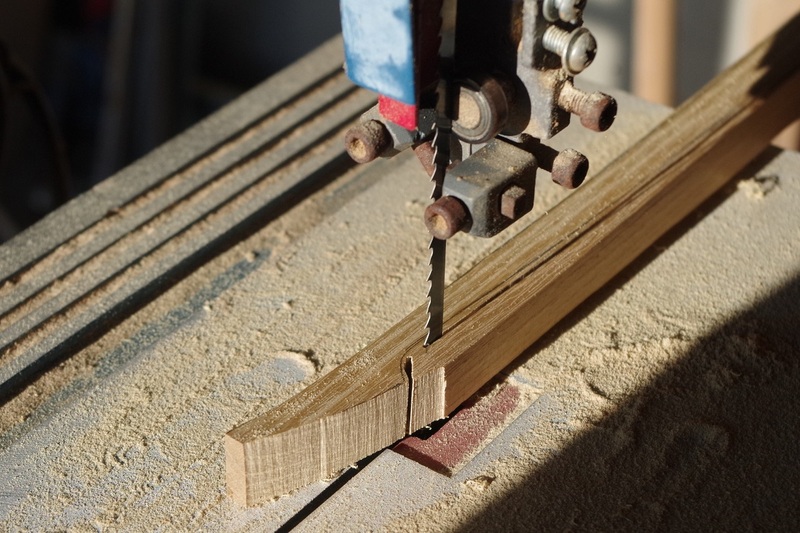 Then you make the tip end wedge to fix the hair in the mortise. Comb the hair to the other end and tie at 4 mm beyond the extremity of the frog end mortise. Make a wedge for this side in the time the super glue dries. Put the hair in the mortise and fix with the wedge as in the video above. Now put the frog in. If it doesn’t stay in place, put some rosin between frog and stick. Please ask questions on the subject to devellop this article. Hey, thanks for the article, I think I am going to try and make a bow! What are the basic starting tools I will need?